Carleton's advantage in break conversion earned them a title. 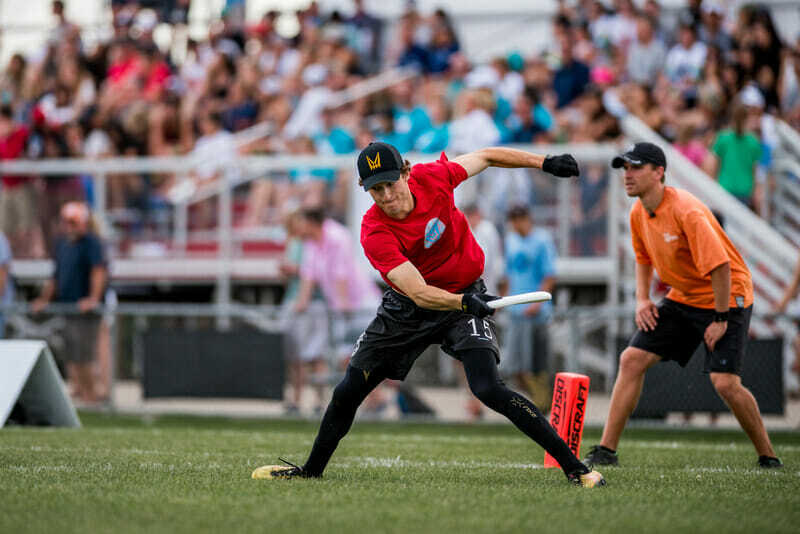 Ultiworld’s reporting on the Men’s division of the 2017 D-I College Championships is presented by Spin Ultimate; all opinions are those of the author. Please support the brands that make Ultiworld possible and shop at Spin Ultimate! UNCW’s defense was generating more turnovers on CUT’s offense than vice versa. UNCW struggled upwind while CUT excelled. a priori of knowing the exact number of turnovers generated by each D-line, CUT’s break conversion efficiency was comparatively high, particularly upwind. the UNCW deep game–devastating in their semifinal comeback–had taken a step back while CUT experienced above-average success. This was super false–both offenses turned the disc over seven times. There were 21 total turnovers in the game; the remaining seven were split among the UNCW and CUT D-lines 5-2 (the mathematically inclined may have figured this out already given the 15-11 final and 8-6 half — think about it…). Based on the stats I collected, this conclusion was (unsurprisingly) valid. On offense, CUT was brilliant in the upwind direction; they played four upwind O-points and completed them with zero turnovers (obviously holding four times). In contrast, the UNCW O-line played five upwind points and turned the disc over four times. It wasn’t just the result of one gusty point or weak line; the four turns were spread out over three points. Their upwind turnover struggles led to the O-line yielding two breaks while going against the wind. The upwind contrast translated over to the D-lines as well. The Carleton D-line was efficient against the wind, cashing in two upwind breaks on just three chances. In contrast, the UNCW D-line struggled to convert their opportunities; they generated seven upwind chances but could only notch two breaks. That’s an upwind break conversion efficiency contrast of 67% vs. 29%. As the previous statistics noted, the CUT D-line was, indeed, over twice as efficient as UNCW in terms of converting upwind breaks. Did the efficiency difference carry over to the downwind direction? It’s hard to say, because as you might remember, CUT’s O-line never turned the disc over going upwind. However, while we might not be able to quantify the UNCW downwind efficiency, we know CUT’s was solid. They generated four downwind break chances and successfully converted three of them. Overall, CUT was devastatingly efficient on the D-line, converting an aggregate 5/7 chances (71%) while UNCW’s total conversion rate was 29%. The stats are murky on this one. In the upwind direction, UNCW completed just 2/6 hucks. CUT threw half as many upwind hucks, connecting on 2/3. Downwind was a different story: UNCW hit on 2/3 of their downwind shots, while CUT completed 6/11. In total, that’s 4/9 (44%) for UNCW and 8/14 (57%) for CUT. It’s fair to say that UNCW regressed in their huck percentage, but also that CUT’s marginal difference was not huge. Commentary — It seems highly likely that aggressively hucking downwind was part of CUT’s game plan. Wilmington was down some key experienced players, and forcing a depleted roster to go 70 yards upwind against your deep defense is a good recipe for getting the disc back. This really turned out to be false. There were only three turnovers on the downwind sideline, out of 21 total turnovers in the game. Qualitatively, this doesn’t seems to be a function of teams staying off of that sideline either; both teams were clearly willing to jam it up the line. While there was not necessarily a game-defining metric in this particular set of statistics, it was nonetheless an interesting exercise for me to compare my real-time observations with a more substantive measurement. Hopefully these numbers provided a different lens for you to consider the Men’s final. Comments on "By The Numbers: Carleton v. UNC Wilmington"